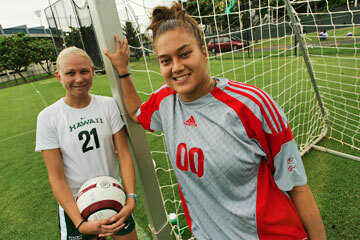 UH seniors Kelly McCloskey, left, and Brittney Aiwohi will be honored after today's match. HAWAII Rainbow Wahine seniors Kelly McCloskey and Brittney Aiwohi will be honored following today's Western Athletic Conference soccer match between UH and San Jose State. Where: Waipio Peninsula Soccer Park Stadium. McCloskey won't play and Aiwohi's chances of seeing action are slim, but it won't dull the special moment accorded UH student-athletes in their final home appearance. McCloskey tore the anterior cruciate ligament in her right leg in the Oct. 1 match at San Diego. She has been rehabbing 3 hours a day with hopes of playing when the Wahine finish the season on the road. Aiwohi, who is celebrating a rare second senior night, joined the team last spring after completing her Rainbow Wahine basketball career. She is the backup goalkeeper and has played 74 minutes in three matches. The Sacred Hearts Academy graduate has not been scored upon or been required to make a save. "I feel very fortunate having known both seniors. They are terrific individuals with a sense of humor and everybody likes them," UH coach Pinsoom Tenzing said. "They work hard and take whatever is given them. They are not critical of their teammates or coaches and don't complain about playing time." McCloskey considered San Diego State, Loyola Marymount and UC Santa Cruz in her hometown before deciding on UH. A trip here with a friend during spring vacation of her junior year at Aptos High School made her decision easy. "I knew right away when I came here that this fit my lifestyle. I'm really an active person and basically grew up on the beach," McCloskey said. "So, beach and soccer kind of got me here. The girls (Wahine members) and I connected really well and I kind of wanted to get out of town." McCloskey was at outside right midfleld for five matches as a freshman, but redshirted in 2003. She was hit by a car on senior prom night and the inflammation of the cartilage under the patella (chondromalacio patella) on her right knee got worse during the first year at UH. "There was no surgery, but I did all kinds of physical therapy," McCloskey said. "I was bummed that I couldn't do what I wanted to do. I could surf, but not play soccer." She was healthy again for spring practice and played in all 20 matches in 2004 and 2005. Her career highlight came in 2004 on the road. "We had a road trip to UC Santa Barbara, USC and LMU. We weren't expected to do too much, but we won all three and I got my first start against USC," McCloskey said. She didn't start this year's opener vs. Washington, but was one of two starting center backs in the next 11 matches, before suffering the injury that ended her consecutive-matches-played streak at 52. The travel industry management major wants to travel to Central and South America after graduating in May. "My family has a house in Mexico, so I've spent a lot of time there. I've always enjoyed that culture," McCloskey said. Eventually she would like either to manage a private club or do event planning. McCloskey did an internship at the Honolulu Club and enjoyed that experience. Aiwohi was approached by the Wahine coaches about coming out for the team and resuming her soccer career after a four-year break. "I debated because I hadn't played in a long time. I went to a couple of practices and the coaches assured me that it was just like riding a bicycle," Aiwohi said. She laughed when asked if playing goalkeeper was really like riding a bicycle again. "My muscles took awhile getting used to all the running, and I strained my right quads with all the kicking," said Aiwohi, who had more soccer offers from colleges than basketball offers as a high school senior. "I knew I wanted to try basketball and never thought I could step into another Division I sport without keeping up with it." Goalkeeper coach Josh Fouts said, "Brittney has improved. Her shot stopping has taken off big time and her distribution of the ball has improved a lot. The footwork and the way you catch a ball is different from basketball and she has adjusted to that." Aiwohi remarked that the basketball and volleyball players all know each other because both teams use the Stan Sheriff Center, but she didn't know many soccer players. "I like the girls. It was kind of cool meeting them. I've had a lot of fun," Aiwohi said. She will student teach in the spring and graduate in May with a degree in exercise science and physical education. "I want to go straight into teaching. Eventually I want to go to grad school and get into physical therapy," Aiwohi said.